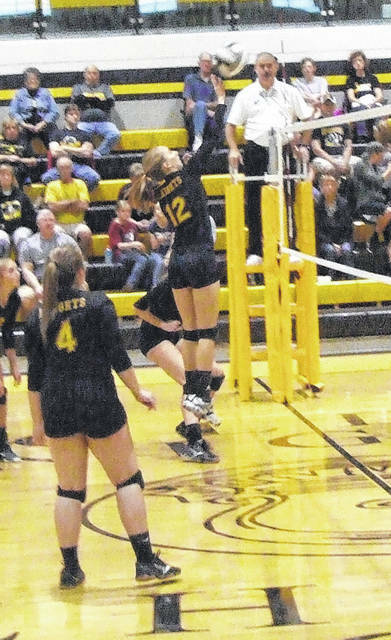 After a slow start to their sectional volleyball contest with Northridge Saturday, the Northmor Knights caught fire and wound up taking a 25-17, 25-11, 25-10 win over the Vikings. The first set was the only one in which the Knights didn’t have a dominating performance. They opened with two points by both Kelsie Fike and Jordyn Zoll and added one from Anna Donner to take an early 7-3 lead, but were unable to put away their 0pponents. They were able to widen their lead to a 15-7 margin behind two points each from Cristianna Boggs and Fike, but then struggled offensively, getting only one offensive point over their next five possessions — a span that saw Northridge get as close as a 21-16 margin. The Knights would get a defensive stop and then obtained two more points from Fike to push their lead to 24-16, though, as they would finish off the first game. The second was all Northmor. After getting a defensive stop to open the set, they got eight points from Zoll, six by Donner and three from Hanna Bentley in taking a 20-3 lead on their way to a comfortable win. The Knights got out to another fast start in the third game, getting two points from Fike, four from Zoll and three from Donner in taking an 11-3 lead. The team only gave up two points to Northridge’s offense in the game, as they continued to pull away, getting two points each from Boggs and Zoll and four more from Donner in completing the sweep. Northmor will next take on Newark Catholic in a battle of the fourth- (Northmor) and fifth-seeded teams in the Division III district tournament. Northmor’s Hope Miracle goes up for a kill attempt in her team’s tournament win over Northridge Saturday.